Pool Cleaning and Maintenance is multipurpose WordPress Theme is a professionally coded, graphically designed, expertise tested, appealingly gorgeous, gracefully ingenious theme. Pool Cleaning WordPress Theme has not only multiple concept but also has multiple features and functionalities. This WordPress theme is a star performer for business related to travel, pool, construction, building, carpentering, resorts, agency, online outlets etc. It has artistic home page layout style and multicolor pre-options for make website more inventive. Pool Cleaning – Pool Service WordPress theme is a modern, clean and professional WP theme; it comes with a lot of useful features those will help it’s used to create their website within very quick time. Pool Cleaning WordPress theme is fully responsive, and it looks stunning on all types of screens and devices. Pool Cleaning WP theme is the best choice for all pool services, pool cleaning services businesses website. 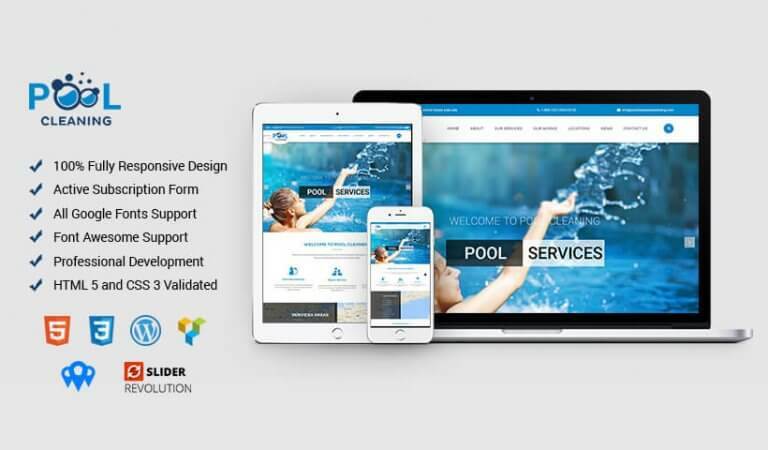 If you’re looking for high-quality designed theme with more extra features for your pool services businesses website, so Pool Cleaning WordPress theme is the best option for you to release your website within very quick time. This Pool Cleaning WordPress theme comes with beautiful version. The concept of theme is great and prolific for every business. Revolution Slider and Visual Composer are best engrossing part of the theme, which helps you to represent yourself wonderfully. Its compatibility with multilingual & cross- browser and support to latest Woo Commerce make user accessibility smooth and interesting. All new sections are designed to fulfill the requirement of a Pool website. Pool cleaning template is designed using different tones of blue for the color scheme to suggest the idea of pure water and people loving their time at the pool. A Perfect, Clean and Unique HTML Template designed for all Water related activity Businesses as like Pools, Water Sports, Courses, Beach Bars, Swimming schools etc. This is an amazing theme! Highly customizable. I love the customer service. I had an issue and the admins responded within 1 day. They actually modified the code in my theme to get it up and working. Can’t wait to buy from them again. This is a wonderful theme! I really couldn’t fault. It’s been easy to work with and will be using it for future projects. Very well designed theme with excellent functionality and plugins. We are currently in the process of designing an e-commerce website and the customer support has been top class who helps me in various problems.